The Security Loan Company, 519 East Pennacook Avenue, South Benedict, NY. The pawn shop, which shuttered in 1973 (the address now houses an upscale pet supply boutique), was one of the few downtown businesses to survive the Great South Benedict Inferno of 1949 relatively unscathed. This is all the more remarkable given that the blaze began in the alley behind the shop, and that popular speculation has long assumed that the Loan Company’s proprietor, Arthur Freeman Trenwick, was the cause of it. Although cleared of any wrong doing by both the initial police investigation and subsequent civil lawsuits, certain eyewitness accounts placed Trenwick at the scene of the crime, and reported fiery glows and uncanny howling echoing forth from the Loan Company’s backdoor basement entrance just before a tremendous (and still unexplained) fireball engulfed the intersection of East Pennacook Ave and Water Street at about 2 in the morning on September 24th. The inferno raged into the dawn, spreading rapidly as it gutted the downtown district, causing millions of dollars in damage and 4 deaths. Trenwick, supported by testimony from his wife and the two boarders who rented their upstairs bedrooms, claimed to be home in bed at the time of the blaze, and there was no evidence within the pawn shop’s premises (or in Trenwick’s home, vehicle or person that pointed to arson or combustible materials of any kind). However, the investigation did uncover a secret room in the pawn shop’s office devoted to the history of black magic and witchcraft. Trenwick claimed the room signified nothing more than an amateur collector’s interest in the region’s colonial history—within the room, investigators found a variety of exceedingly rare and disturbing manuscripts (such as Van Beveren’s The Witches of the Hudson River Valley, and Smith’s Tales of Woe) as well as maps, robes, totems, strange animal skeletons, and foul smelling tinctures. After the investigation closed, Trenwick was never quite accepted back into the fold of the community. 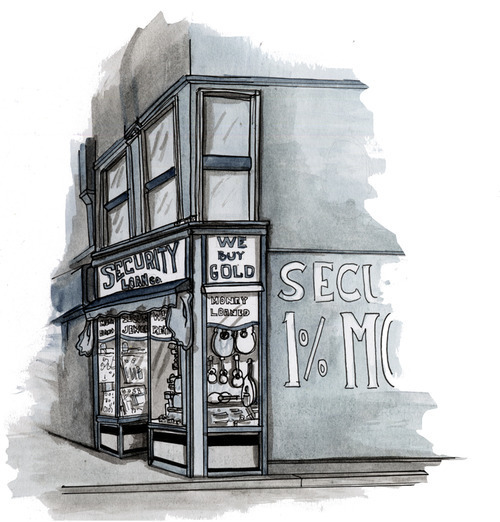 He and his wife sold the pawn shop and left South Benedict in 1952, leaving no trace as to their whereabouts beyond an Anchorage, AK post office box that was canceled for nonpayment in 1954. The fate of Trenwick’s witchcraft collection remains unknown.